• 19 nos. installed at M/S Bhander Power Limited for their 500 MW Gas based power plant. • 12 nos. supplied o NTPC Limited for their 817 MW power plant. The obvious advantage of Air cooled fluid cooler is that it does not require any water after its first charge. This is completely a closed circuit system. The hot fluid (water) from the source is made to pass through finned surface heat transfer coils & using the heat is rejected to ambient air passing through coils using axial fans. Cooling media is only free air. 100 % water saving-Does not require water after its first charge. Water treatment plants and chemicals not required. Does not require any tube well boring. No problem of scale formation. No dreation of DG set due to scale formation. 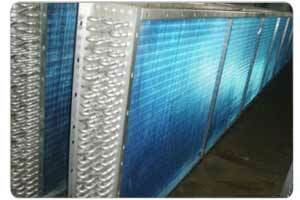 Cooling Tower and Shell & Tube Heat Exchangers are not required. Raw water pump is not required. Substantial energy saving during mild weather conditions. No fear of air contamination or pollution. No Engine downtime for maintenance. Steam turbine exhaust steam condensing. Air-cooled Fluid Cooler is High Efficiency dry cooling system. Air cooled fluid coolers works on principle of rejecting heat from hot fluid to ambient-air directly through heat transfer coils. 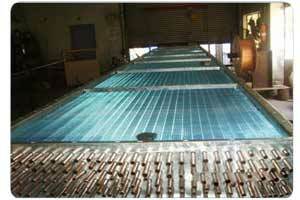 This is in contrast to conventional method of cooling using shell & tube heat exchanger & wet cooling tower system. Heat Transfer Coils : The coils are made of seamless copper / steel tubes & fins of Aluminum / copper high efficiency sine wave Fins produced on our automatic punching press.The selection, construction of coils is through CAD / CAM system, which is unique feature of our advanced technology. Hydraulic / Bullet Expantion process is used for tube expansion which ultimately makes high efficiency heat transfer coils. We are using Coil design software to design coil. Axial Flow Fans : Axial flow fans are direct drive with adjustable pitch aero foil designed. The fan blades are of Glass reinforced polyamide/ polypropylene of Aluminum & pressure die cast alloy hub. The fan is directly mounted on the motors shaft using taper lock bush for execllent gripping. Casing : Casing is made of Epoxy coated / Galavanised Steel. Motors : Motors are totally enclosed fan cooled type (TEFC), to protection against dust/moisture with class F installation and 415 ± 10V / 3ph / 50 HZ.of reputed make. Headers : Header are made of heavy duty steel / copper pipe and are complete with mating flanges & air purging valves. 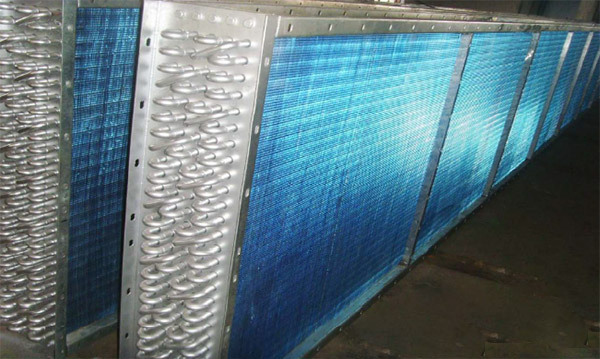 The Shell and Tube Type Heat Exchangers are the most common type of heat exchanger used in the process, petroleum, chemical and HVAC industries, it contains a number of parallel tubes inside a shell. 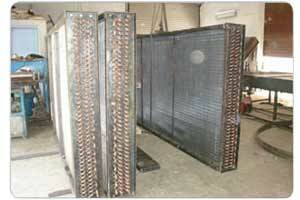 Shell & Tube type heat exchangers are used when a process requires large amounts of fluid to be heated or cooled. Due to their design, shell tube heat exchangers offer a large heat transfer area and provide high heat transfer efficiency. 12 nos. 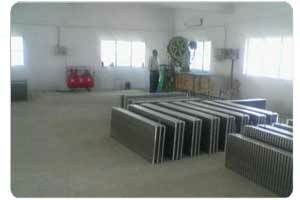 1000 mm w x 10000 mm long supplied to NTPC.